Ted Williams, the homeless man whose voice is described as “golden,” already received a great opportunity from God; he recorded a commercial for Kraft Macaroni and Cheese. He also reunited with his mom. A video posted by the Columbus Dispatch showed Ted walking quickly toward his mother at their New York reunion at a hotel, the first time they’d seen each other in about 20 years. Both of them were in tears. Ted said he just finished doing a commercial for Kraft Macaroni & Cheese that will air Sunday during the Fight Hunger Bowl on ESPN. According to Fox news, Ted recorded voiceover promos Thursday for MSNBC’s Lean Forward campagain, and the spots will begin running immediately. He’s being paid for the spots at an undisclosed amount. Can you imagine how thankful he is for these blessings from God after being homeless so long? He’s being offered lots of jobs right now, but in his interview on the Today show, he said he wants to choose just one, because the rest of the offers are just too overwhelming right now. (He’s even being offered a movie role!) He also said that he hopes to get therapy with a pyscyhologist who’s a contributor on Today’s staff, to work on his issues, which I really hope he will do. That way he won’t be on his own to deal with the overwhelm of offers and sudden publicity, and can have someone to help him through his addiction recovery process. 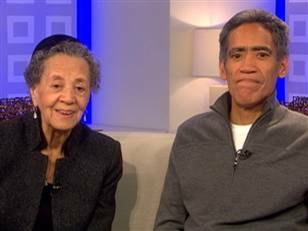 The interview of him on the Today show with his mom Julia is here. Ted also taped an appearance on the NBC late-night show hosted by comedian Jimmy Fallon, who told him his voice “is golden.” I agree, he has an incredible voice. I believe God wants to use this man for His glory and am really praying for him to keep clean from addiction. When I watched the video of him and his mother Julia being interviewed on the Today show, I was intrigued by his mother. She looks great for being in her 90’s and was amusing sometimes, being so stern with him live on air about getting his life straight with God and especially when she talked about the sign he was holding, which embarrassed her and her family. The sign is what gave him his break! Besides, this is not about personal appearances, but about someone who’s fallen down and needs help getting back up – and more importantly, staying up! She said he is her prodigal son and is hoping he will finally get his life straightened out. I wanted to just shake her and tell her to say something positive to the man, but I’m sure she’s been through a LOT of worry and concern over Ted. I am praying for them both, especially that Ted won’t relapse with all this attention coming at him all at once. Some of the comments I read on YouTube were that Julia provides the “tough love” Ted needs. What do you think? Was Julia too harsh on Ted, especially during the interview? Did you think she was a critical person? Or did you think she was just speaking truth to him that he needed? Have you ever had to deal with someone addicted to drugs and alcohol? (Again, the interview on the Today show is here.) Please leave your comments below. Below is the Kraft Macaroni and Cheese commercial with Ted. The commercial itself is pretty funny. The little boy cracked me up when he talked about dad being in the doghouse. The mom’s expression at the dinner table is hilarious. You hear Ted’s voice at the very end. I am praying for a happy ending to this story, for God to help Ted stay clean of drugs and alcohol, and that the rest of his life will be victorious. Please keep this man in prayer!